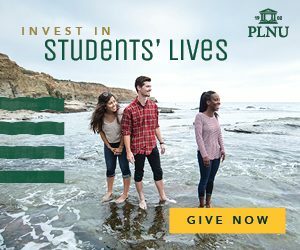 “The idea of being made in God’s image—that we were created and that we can create—is an incredibly powerful characteristic of being human,” said Dr. G. James Daichendt, PLNU’s dean of arts and humanities and professor of art. From stickers found on the backs of street signs to murals painted on the sides of skyscrapers, street art creations in urban areas provide meaning to spaces shared by many. When most think of street art, the idea could conjure images of graffiti and tagging—along with associations of delinquency. But street art and graffiti are distinct. While graffiti is steeped in writing and includes markings of an individual or a group, street art merges together the principles of design and art. Street art is formed with aesthetic in mind, and, like all influential art, points to something much grander—an exploration of meaning and purpose. Almost all artists, including street artists, are driven by the idea of something bigger than themselves. Though their views might be different, they are imagining worlds that “could be” and are expressing them through their mediums. Because of this restorative power of art, our creations have the ability to transform our experiences with each other and with our environments—pushing on the edges of edges and creating the culture we live in. While Daichendt is well-schooled in art education history and aestheticism, his favorite place to see art is outside, open and available to anyone regardless of economic or cultural status. It’s there where street artists use the expanses of our cityscapes as canvases, transforming the stark and modern metropolises we inhabit and breathing life into these environments. 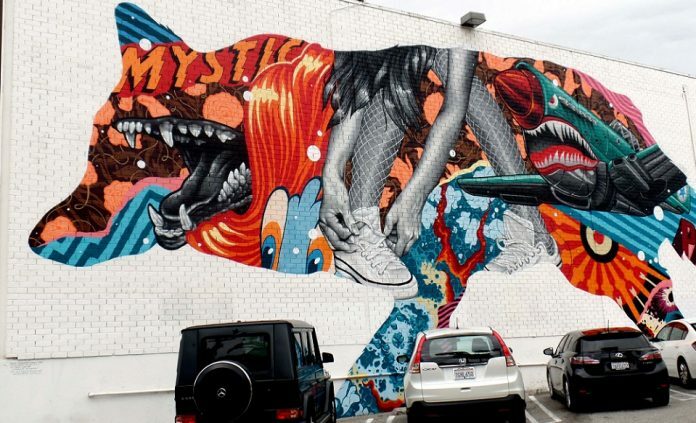 The Los Angeles Arts District, a neighborhood in downtown Los Angeles, was transformed by street art. Before artists began moving to the area, the district was overlooked—and filled with warehouses. Almost all street artists share a common passion: they want to make an impact. As a result, they are propelling society forward not only by reviving communities, but especially through the difficult themes conveyed in their art. Many messages addressing racial tensions, political changes and cultural norms pervade throughout street art landscapes. One example of this is through the work of French street artist, JR, who is known to challenge widely held preconceived ideas. His global participatory project, “Inside Out,” also known as “The People’s Project,” is intended to allow people to “share their untold stories and transform messages of personal identity into public works of art” through large-scale portraits of themselves plastered on walls across the world. Among the 200,000 people who have participated in more than 112 countries, a number of themes have emerged from their portraits, including hope, ending gender-based violence, and a call for environmental change. Whether it’s created by someone like Shepard Fairey, a passionate anti-war advocate, or JR, someone whose mission is to humanize all individuals and groups of people, street art is baring threads of commentary, adding significantly to the conversation of what it means to be human. As Daichendt shares the concepts and messages of this innovative and exploratory art form with students and peers, any initial stigma about street art and its creators slowly falls away. What’s left is an understanding of the deep meaning these creations seek to communicate. “As folks engage with it, they start peeling the layers away and realizing there is so much rich dialogue and so many fascinating things happening here,” Daichendt said. “I believe that it is my job as an educator, professor and researcher to investigate these things so people can understand them. When asked what he wants people to take away from learning and thinking about street art, Daichendt pointed to our own self-imposed boundaries of art: rules, techniques, histories and our own thoughts.